I’m publishing this week and next week’s sonnets for two reasons. First, they illustrate the evolution of an idea over the period of approximately 10 years: the unrequited love, the daydream of waiting for someone to come over who never will. Second, I’m publishing them in honor of Valentine’s Day, a holiday which I have come to realize is important to exactly three types of people: those who are single, those who are dating, and marketers. I belong to two of those camps. Guess which ones. At any rate, here’s the first of the two sonnets. I wrote this first sonnet in college, back when we had on-campus apartments and visiting friends was as easy as walking a block or two. At that point it wasn’t uncommon to have people (even whatever guy I was crushing on at the time) wander over pretty spontaneously, but it never happened as much as I wanted. Even though those days are long gone, they still feed my daydreams, as you’ll see next week. Even though I included it in the ill-conceived book of poems, this sonnet is good by no objective measures. I didn’t bother editing it at all, simply because it’s meant as a contrast to next week’s sonnet. That you will come and make everything fine. 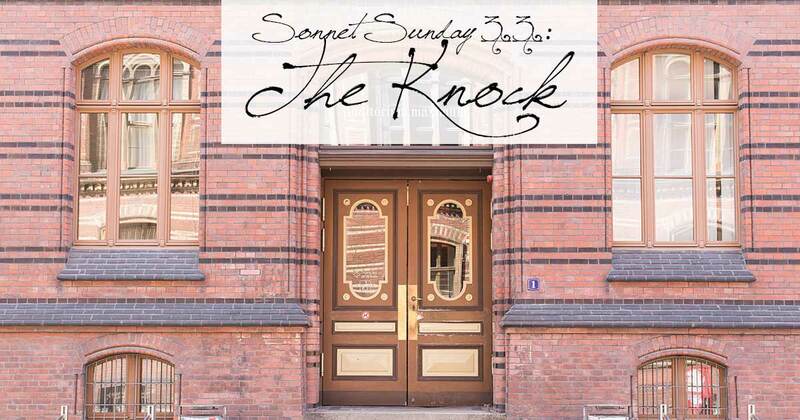 1 Pings/Trackbacks for "Sonnet Sunday 33: The Knock"